We had a slight problem with our fridge for most of the week. Actually it’s been going on for most of the month, but it was the worst this week. The fridge part seems to be getting too cold that it occasionally freezes some of the things in it like the water in pitchers, the eggs (which I had to discard), some of the yogurt, and others. Once or twice my veggies froze as well. It’s been annoying, but for a while it was manageable. This past week, however, has been totally discouraging, and I had a bit of problem thinking of something new to do. I needed to get rid of some of the stuff before it goes bad by the weird freezing cycles. There was a small pack of sliced beef in the freezer and I thought I’d try making something out of that with the remaining veggies I had. I was also craving for something spicy, and I immediately reached for my cayenne pepper shaker. I was thinking to try some sort of stir fry or sauteed beef. Here’s what I did. 1. Mix the marinade ingredients together and pour over the beef strips. Toss until fully coated and submerged. Marinade for about 10-15 minutes. Fish out the beef and set aside the remaining marinade. 2. Heat some oil in a frying pan or sauce pan. Put in the garlic and cook until a bit brown. Toss in the onion strips and cook until translucent. 3. Put in the marinaded beef. Cook in high heat until all sides of the strips are seared, about 3 minutes. 4. Add the carrots and stir fry in medium heat for about 8-10 minutes. Add a bit of vegetable stock whenever the pan gets dry. 5. Season with salt, pepper, and more cayenne pepper. It’s actually a pretty straightforward and easy process. 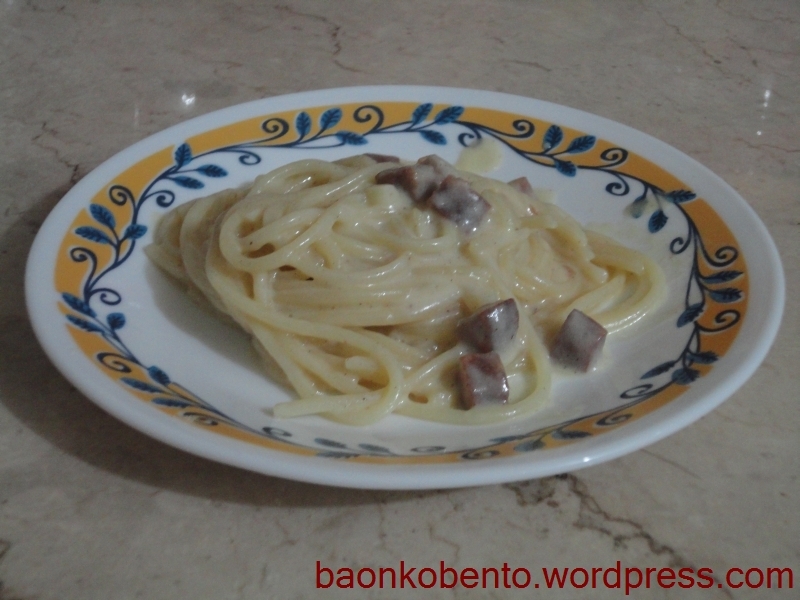 With the preparation and cooking, it took about 25 minutes to complete. 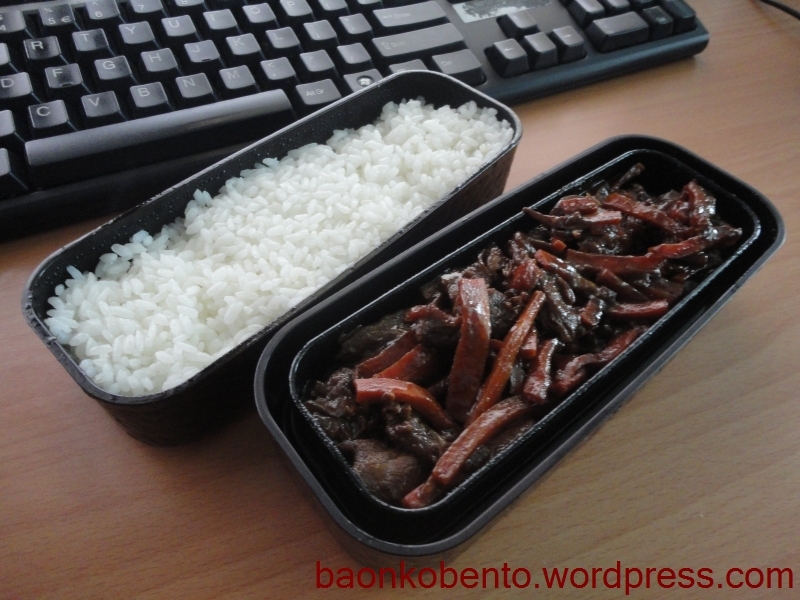 I put it all in a bento along with some freshly cooked rice, and I tasted the dish come lunch on that day. For good measure, I ran it in medium high microwave for a minute before eating. It was every bit of spicy that I was looking for. I can clearly taste the marinade on the beef, and the carrots added some texture and color. 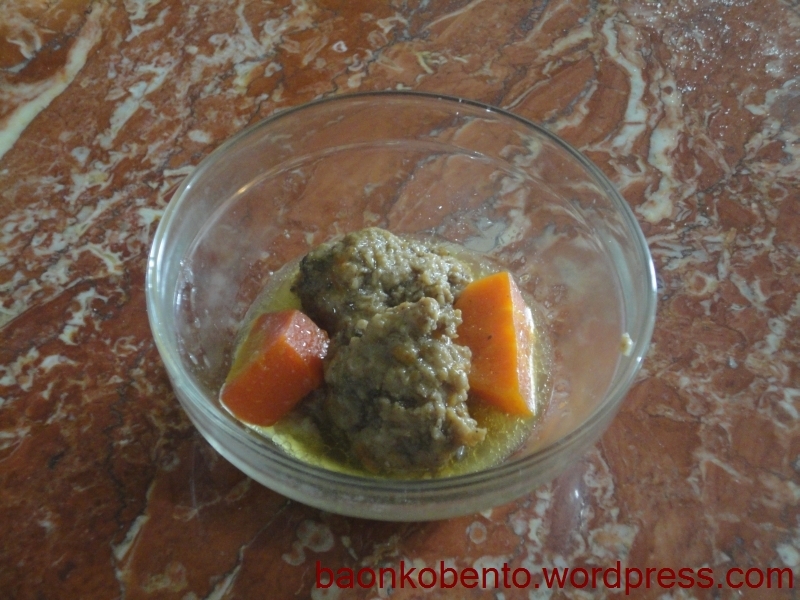 The beef turned out to be not that lean, and exuded some oil when I ate it at lunch time. 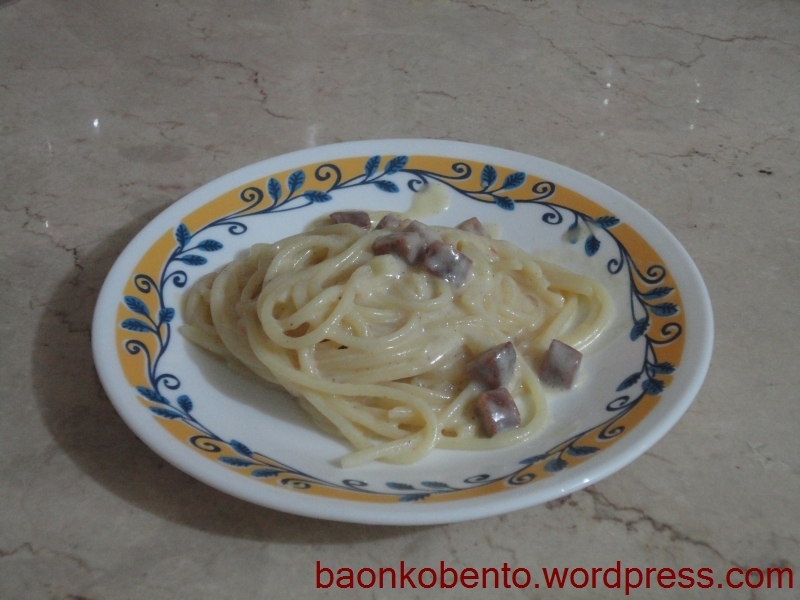 It wasn’t that much of a big deal, but it would definitely taste better if I used not so fatty meat. The onions wilted considerably, and curled into almost unrecognizable balls among the beef. I’m thinking I could delay putting in the onions with the carrots next time, instead of sauteing it before the beef. To be honest, I was also a bit afraid that I didn’t cook the beef long enough, but it was cooked just fine when I tasted it. It seems 10 minutes in medium flame would do for thin strips. It was a very interesting and informative experiment. I found that it’s not that hard to cook with non-ground beef (I had previously been cooking almost exclusively chicken), and an important process in cooking is the marinading. There’s a lot of scope for variations there, and I’m excited to find out what else I can come up with in marinade and stir frying. I have been trying to find alternatives to Shake-n-Bake, as I’ve done here. It hasn’t been very successful so far, and I haven’t had the chance to try some variations on that recipe I did before. Lucky for me, there was a likely candidate in a cookbook I borrowed from my in-laws: The Recipes I Love by Norma Olizon Chikiamco. 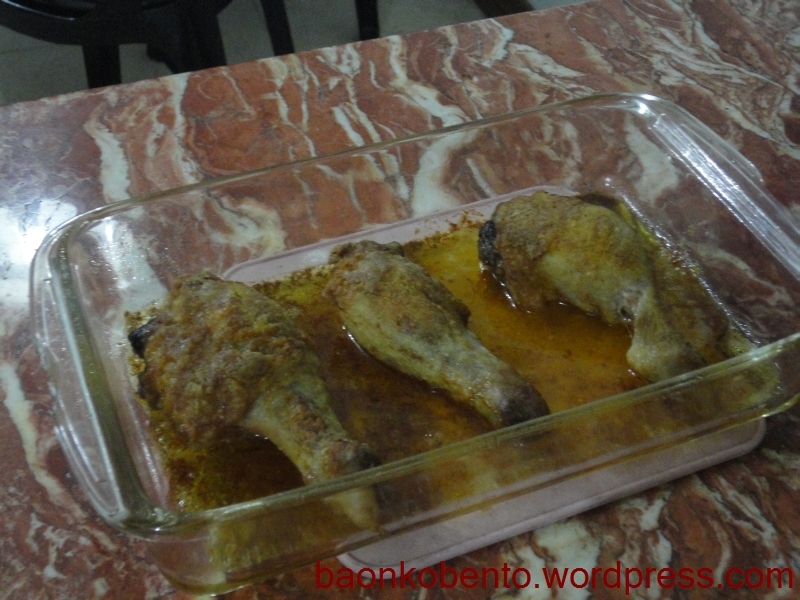 The basic idea of her Chicken Paprika is similar to Shake-n-Bake: coat chicken pieces in a powder mix then bake in the oven until done. The main difference that I found very interesting is using a baking dish lined with melted butter as opposed to using a cookie sheet. The powder mix is just flour, salt, and ground paprika. Her recipe called for using a bowl to coat the chicken, but I think this will work pretty well if we put the powder mix into a plastic bag and coating the chicken through shaking. 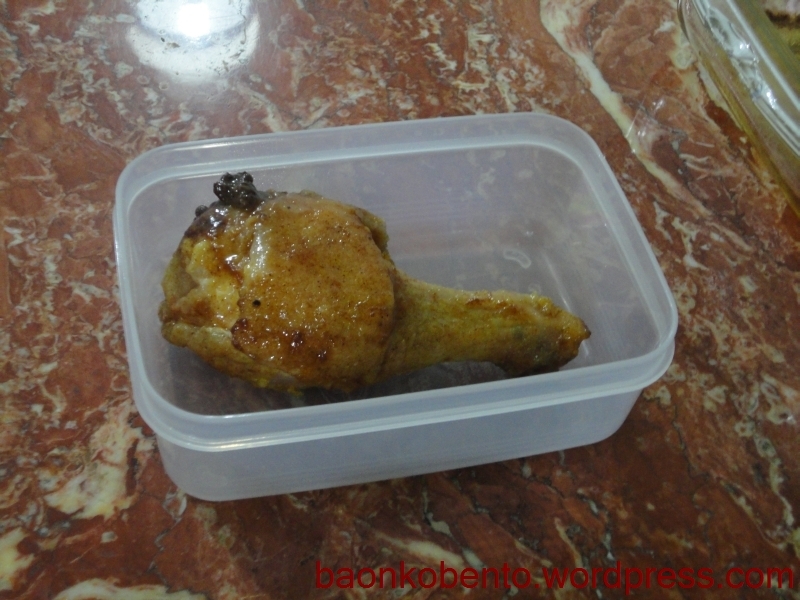 I used chicken drumsticks, and brought it as baon. It tasted great! I may have found a great substitute for Shake-n-Bake, although this did not come out crunchy. Think of KFC classic chicken, and it would not be far from the texture that came out of this chicken paprika. 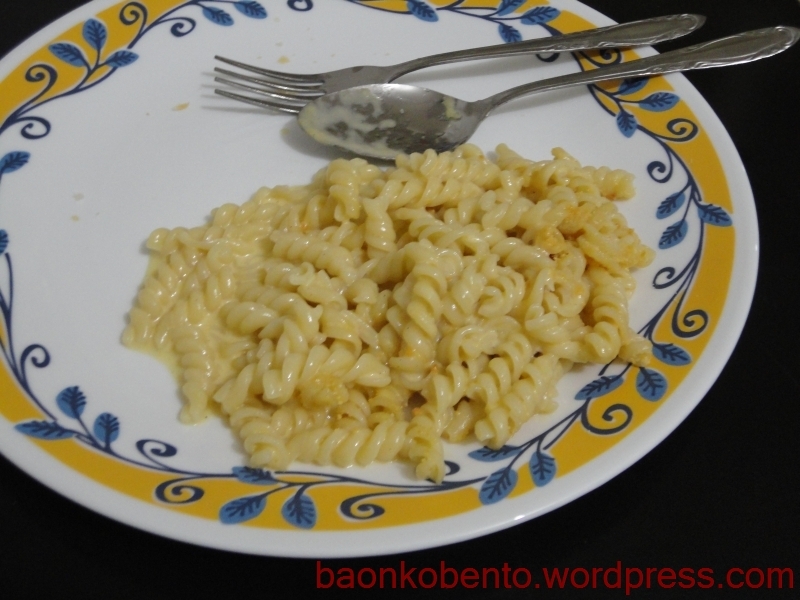 As for the taste, I can stand a bit more paprika for extra kick, but this tasted well enough for a non-spicy dish. I’m thinking of substituting some of the flour with panko breadcrumbs to add crunchiness to the chicken. Another dish from the Just Bento Cookbook: stewed chicken and carrots. It actually has a copy online here, so you can go check out the original recipe. I made some adjustments because of some things which aren’t available. 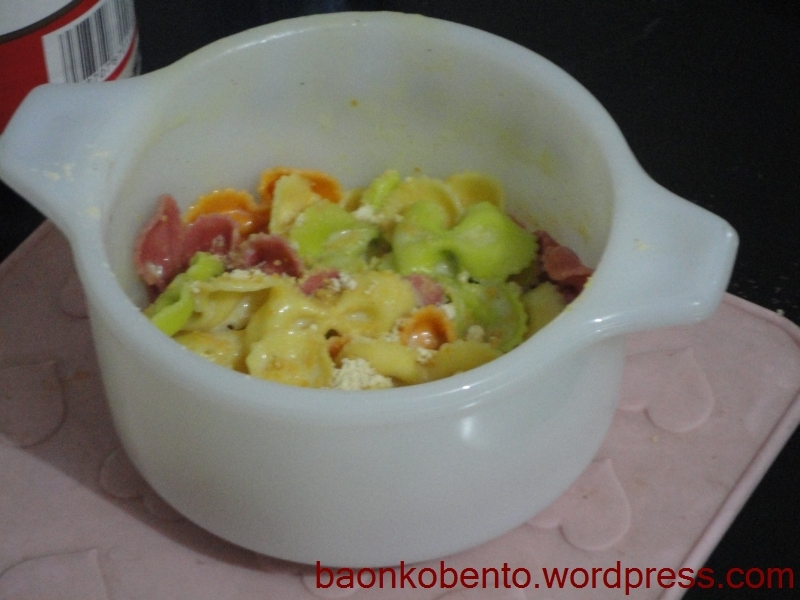 Frankly, I was expecting the worst mostly because I messed around with the measurement of the ingredients, and it’s the first time I’m making this dish! I was aghast at myself. I plowed forward nevertheless, and adjusted the broth ingredients as well to compensate for the increased amount of chicken mixture. Anyway this is how it looked like when done. Surprisingly, it tasted wonderful! Looks aside, I think it tasted exactly how it should taste. It was nice when I had it for lunch today, and it goes remarkably well with some of the kamameshi rice. It freezes well too, along with a bit of the broth. Since it was quite easy and quick to make, it will be one of my freezer stash mainstays.